It’s Week 5 of Spring Term here at Carleton and I’m wondering where the hell the term went. I’ve been so busy I’ve barely had time to catch my breath, or blog—and this is supposedly my “light” term, since I’m only teaching one class. Ye gods. I’ve been reading about, and contemplating, the “flipped classroom” concept for quite some time. (The basic idea is that the “lecture” part moves outside of class—students do this part on their own—and classtime is spent on “homework”—more involved problems that get the students to grapple with and apply the material, under the guidance of the professor, in groups.) Since I’m only teaching Intro this term, and since I’ve taught Intro so many times that it’s second nature to me, I decided to experiment with flipping my Intro classroom this term. I made some modifications to the model: I don’t post any video lectures, nor do I have an online discussion component. What I have done is assigned very targeted readings and exercises before each class. Most of the exercises the students do on their own. I frame these exercises as a self-check: “after doing today’s reading, you should be able to do the following”. The students hand in one exercise at the start of class. Sometimes it’s a programming exercise, sometimes it’s algorithm development. Based on the exercises that come in early enough and my past experience with certain tricky concepts, I will sometimes do a short lecture/example/summary at the start of class. The bulk of classtime is spent having the students work in pairs on programming problems. I usually have them work on a problem for 1-2 classes, and then hand in the finished product a few days later (so that they have time outside of class to finish up if need be). The main thing I’ve learned from this experiment is that I talk way too much! The urge to lecture is strong. But I’ve also seen gains in learning and, more importantly, tremendous gains in confidence in my students using this model (particularly when I shut up and get out of their way). They’re working on what’s traditionally been an angst-ridden, tricky project involving datasets and lists this week, and I’ve been amazed at how smoothly it’s gone. They’ve even found conceptual issues with the textbook, on their own. I’ll admit, I’m flipping for the flipped classroom! There are some changes I’m contemplating. I see myself posting some videos in the future (particularly around class development and recursion), and I may add a discussion board in the second half for students to post (and respond to) questions about the readings. But so far, I’m very pleased with the results. It will be interesting to see what the students say on their midterm evaluations about the model, to see if they are as enamored as I am. Research: Writeups and grant apps and data, oh my! My research life is where I feel torn in many different directions. On the one hand, I’ve got a tremendous backlog of data to analyze and stories to tell about that data. I figure I have 3 more papers worth of stuff there. So I’m trying to get those out into the review stream. One’s close, but I’m having problem with the framing. One needs a lot more data analysis before the story becomes clear. And one I haven’t even started yet. On the other hand, there’s this new research I want to get moving on, on self-healing networks. Even here, I’m pulled in 2 directions: extending my current work, to develop general system heuristics for quality of experience prediction; and extending the general idea of self-healing networks into the home networking space specifically. Thanks to our IT folks, I’ve been able to expand my testbed so that I can try a whole bunch of crazy things, but finding the time to design and carry out experiments is tricky. But I need the data from the experiments so I can write the necessary grants so that I can do more experiments. When the number of hours I can spend on research each week is in the single digits, finding the right balance between writing and new research is a struggle. I’m still trying to figure out that balance. Someone told me that going from one kid to two is an exponential increase in work, and darned if that isn’t true. My son’s been home for 4 months now, and I’m still trying to get the hang of being a parent of 2. Not to mention all of the adjustment issues inherent with adopted kids and the daily assertions of independence from my almost-5 year old. One thing my lighter teaching load has afforded me is the opportunity for weekends mostly free of (school) work, so I am enjoying the extra family time. I just wish these kids didn’t exhaust me so thoroughly! The big project on the home front has been the post-adoption stuff. Reports and social worker visits at 1 and 3 months, plus another one next month. Paperwork, paperwork, and more paperwork. We’re also starting the process of finalizing the adoption, which means….yep, more paperwork. But if all goes well, the adoption should be finalized this summer (and then we get to apply for citizenship and a passport and a SSN…the fun never ends. Yippie.). And in the end, it all means we have this wonderful, funny, happy, loving little boy in our family, so of course it’s all so very worth it. So that’s a snapshot of life, spring-term style. What are you up to this spring? Now, going in I indicated that my time totals might be a bit wonky due to several factors: single parenting, first week of classes (= lighter workload), light teaching and service term. And in fact there were unforeseen snafus: one kid had major sleep issues (falling asleep and staying asleep), which threw my schedule into all sorts of disarray. Also, the combo of single parenting, sleep issues, and first week back in the classroom meant that a few evenings when I would normally have worked for a few hours, I vegged instead due to sheer exhaustion. I would have guessed around 40 hours of work, and I wasn’t too far off: the total hours I spent working came out to just under 39 hours. The first two charts show, in hours and percentage of time, how my work hours broke down into broad categories: teaching, research, admin, service. “Admin” is sort of a catchall category: I counted general email, general reading for work, work-related social media, chatting with colleagues, etc. in this category. 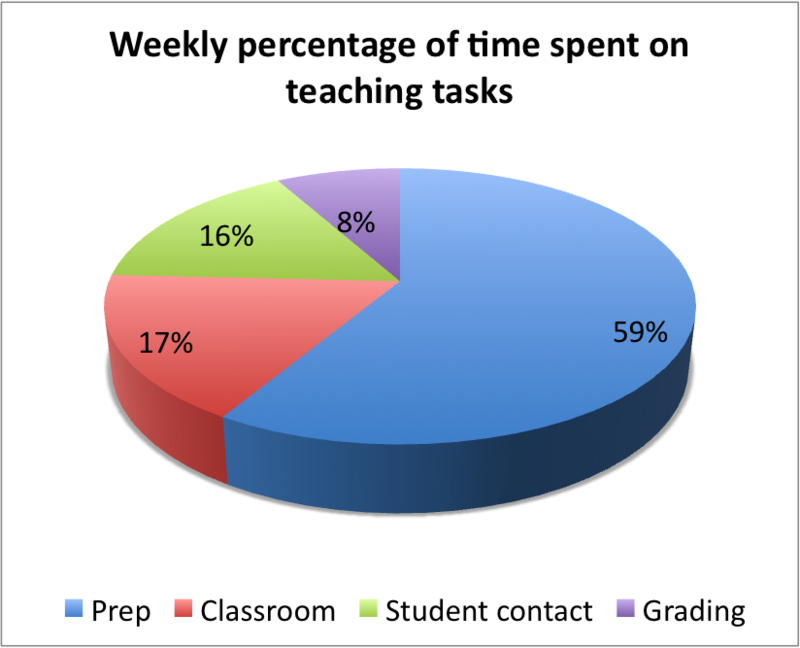 As expected, teaching takes up the majority of my time, with administrative tasks coming in second. Sadly, I spent twice as much time last week on administrative tasks as research. However, the research breaks down to roughly an hour a day, which is respectable during the term (and certainly better than zero). This number will definitely improve over the course of the term—I’m guessing it will stabilize around 8 hours/week (except during the craziest of weeks), due to my lighter teaching load. I decided to break the teaching category down further. In the plots below, “student” refers to student contact hours outside of class—office hours, random drop-ins, conversations after class, etc. “Classroom” refers to actual time spent in the classroom (or meeting with my independent study student). 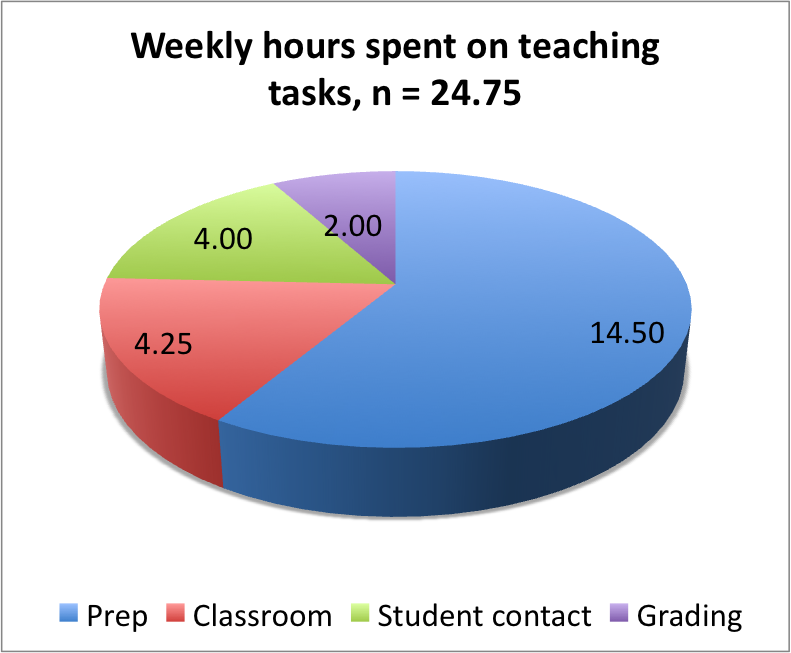 Note that total teaching hours are slightly higher here than in the first two figures because in some time periods I did two different types of teaching tasks, so I double-counted those. “Admin” takes up a much larger portion of my time than expected. I spend 3 times as much time prepping for class as I do in class. Even though I have a grader, I still spend time on grading, about half of that managing my grader. 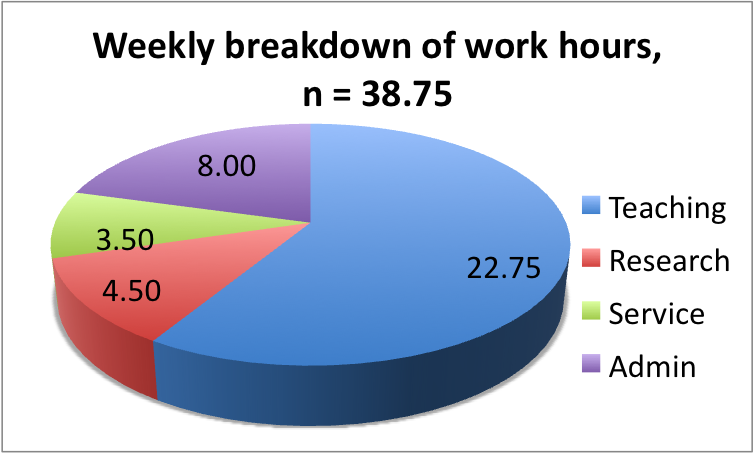 Last week was typical percentage-wise, I think, but low hours-wise. Even so, my “light” week was just under 40 hours. I’d like to repeat this experiment again later in the term, perhaps during a “heavy” week. The differences would be interesting, and I’m particularly interested in how much time my job takes up during those crazy weeks vs. during light weeks like this one. But one thing’s for sure: I’m not lounging on my back deck sipping margaritas all day! 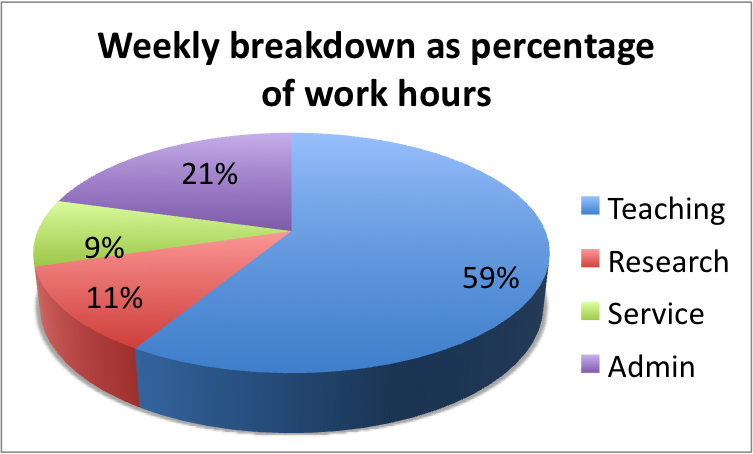 How does your workweek break down?